We Have a Big Plastic Problem. How Do We Fix It? In the 1950s, plastic was seen as the preeminent solution to our manufacturing woes. Production became cheaper, consumer products became more affordable, and the weight constraints of wood and steel were finally lifted. That was the good life. Sixty years later, the miracle of plastic has become an enormous global problem, and the good life needs redesigning. Plastic mass-production was instrumental in technological advancement, from lightweight automobiles to tiny computer parts. Plastic even made me possible: when my father first immigrated to Canada, he was able to find work only on the production line at a rapidly growing plastics plant, which was in desperate need of labour. Unfortunately, the excitement of new industry left us blind to its consequences. To date, we’ve produced over 8.3 billion metric tonnes of plastic (read: 8.3 trillion kilograms), and our annual rate is expected to keep climbing. Not much of that sum has disappeared; plastic takes centuries to biodegrade. Of the 91% that hasn’t been recycled, a small portion (12%) has been incinerated, often illegally. The rest piles into our landfills, and, eventually, leaks into our oceans. Ocean leakage is particularly common in developing nations that lack regulated disposal systems. Plastic waste in the ocean accounts for over one million sea creature deaths per year. We’ve all seen the troubling images: six-pack rings deforming the shells of sea turtles; plastic fishing nets strangling seals; or the occasional cross-section of a marine mammal whose stomach is filled with plastic garbage. But the most dangerous consequence of ocean plastic pollution is more insidious than that. While plastic doesn’t readily biodegrade, it is prone to photodegradation—the decay of polymers from light exposure. Macroplastics—the big pieces that enter the ocean—keep photodegrading until they reach microscopic size, becoming microplastics. Microplastics are ideal for housing toxins, and quickly enter the marine food chain. Bigger fish eat multiple toxic smaller fish, causing the concentration of microplastic to grow (known as bioaccumulation), and those at the top of the chain become the most vulnerable. As you might have guessed, that’s us. The plastic problem won’t resolve itself. A garbage truck’s worth of plastic is washed into the ocean every minute, totaling 8 million tonnes annually (and rising). Just this year, microplastics have been identified in the remote Arctic Central Basin, illustrating the breadth of the epidemic. We created plastic, and we have a responsibility to deal with the repercussions. But cleaning our oceans is futile until we find a way to stop ocean-bound plastic. Options like zero-waste lifestyles and shoreline cleanups are great, but ultimately too small in scale. At Plastic Bank, we believe the most viable solution is to drastically improve worldwide recycling. But how? In Western countries, recycling has been a part of the public conscience for decades, but we’re still inefficient recyclers, opting for landfilling instead. 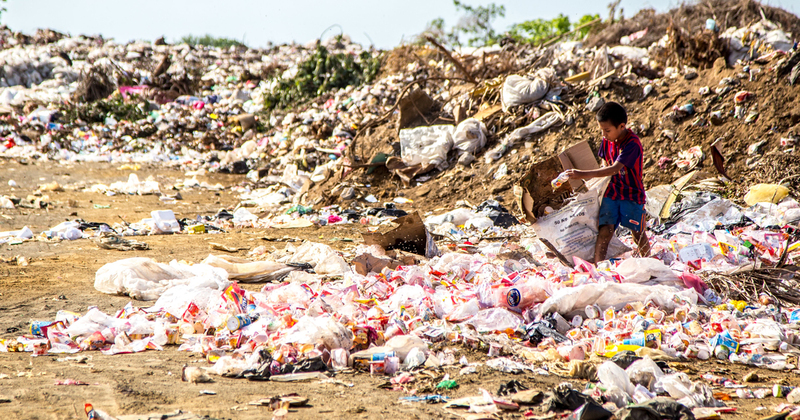 In developing nations, recycling is deeply buried in a list of other priorities, despite the horrifying volumes of plastic waste polluting waterways and impoverished communities. It makes sense: if used plastic holds no value, why collect it? If you live near a bottle depot, you’re probaby happy to bring in your bi-annual haul of recycling in exchange for some pocket cash. But what if your Ziploc bags, takeout clamshells, and disposable cutlery had dollar values, too? In fact, they do. We just need to harness them. Unlocking the economic potential of plastic waste is the root ambition of The Plastic Bank. In doing so, we’re helping people in the world’s most vulnerable regions earn a stable income. And, finally, stopping plastic from flowing into the ocean. With this strategy, redesigning the good life does not require a sacrifice for the greater good, but rather a desirable improvement in our economies, health, and planetary stewardship. In accordance with transforming the linear plastic chain into a sustainable cycle, new applications for recycled plastic are continually being investigated. For example, researchers in India have discovered that recycled plastic can be used to make more flexible, durable roads. The possibilities are endless: scan your immediate surroundings and you’ll find numerous products that could be plastic-based. A plastic-neutral future is possible, but with every passing moment, the mountain gets harder to climb. If we want to redesign the good life, we need to redesign our attitude about plastic. Want to learn more? Join the Plastic Bank team at SB’18 Vancouver, where our founder and CEO David Katz will take the stage.